Clarins Blue Orchid Face Treatment Oil SALON SIZE 125ml withbox. Clarins Lotus Face Treatment Oil SALON SIZE 125ml withbox. Clarins Face Oil Blue Orchid 5 x5 ml Miniatures Condition is New. CLARINS BLUE ORCHID FACE TREATMENT OIL - 2ML - BOXED Specifically formulated for dehydrated, tired-looking skin, Blue Orchid Treatment Oil energises and restores radiance for a fresher-looking appearance. Formulated with essential oil of Patchouli and Blue Orchid extract, this fine, lightweight oil is immediately absorbed to moisturise and rebalance skin. Leaves skin feeling moisturised and satin-soft. & URBAN POLLUTION. ANTI-ELECTROMAGNETIC WAVES. SCREEN MIST. 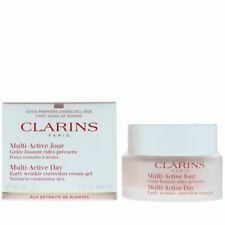 Clarins Multi Active Day Early Wrinkle Correction Cream 50ml. Christmas 2018 gift set. Instant Smooth Perfecting Touch 4ml. FULL SIZE Instant Light Lip Comfort Oil - Honey Glam 7ml. Gentle Refiner 15ml. Formulated with acerola fruit and spergularia, skin is left feeling comfortable and looking brighter. To use: Apply mornings and/or evenings to cleansed face and neck. Specially formulated for Asian skin. 1------Mission Perfection Serum, dark spot corrector even skin tone. THIS KIT CONTAINS Give your skin the chance to recover its luminous, even appearance and show off an incredibly beautiful skin tone. NEW Clarins Multi-Active Nuit Cream Normal/Combination Skin 50ml / 1.6 oz. Reduce the appearance of wrinkles and fine lines, boost cellular renewal, and ensure your skin looks toned and healthy upon waking. To use: Apply in the mornings to a cleansed face and neck by pressing gently, starting from the centre of the face and working outwards. New listingNEW Clarins Daily Energizer Cream 30ml / 1 oz. Removes even the smallest imperfections for a clear, youthful complexion. Skin is nourished, smoothed and shine free. 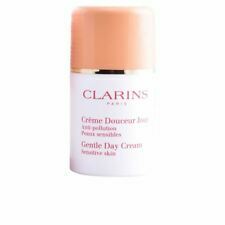 Clarins Daily Energizer Cream is non-oily and perfect to use before applying make-up. NEW Clarins Hydra-Essentiel Rich Cream for Very Dry Skin 50ml / 1.8 oz. Organic kalanchoe extract hydrates skin while boosting its hyaluronic acid production, leaving skin nourished and comfortable. To use: Apply to a clean face and neck. Clarins Hydraquench Cream-Mask 30ml Hydraquench Cream Normal To Dry. NEW Clarins Daily Energizer Cream-Gel 30ml / 1 oz. Deep hydration and revitalised skin with a matte finish. Clarins Daily Energizer Cream-Gel is non-oily and perfect to use before applying make-up, skin is nourished, smoothed and shine free. (CONDITION OF ITEM: NEW & BOXED. Faster and safer for both parties). Especially with Echeques). ==============. =============. CUSTOM DUTIES. New listingNEW Clarins Face Treatment Oil Lotus Oily/Combination Skin 30ml / 1 fl.oz. Leaving it velvety soft. To use: Apply a small amount to a cleansed face and neck whilst the skin is still damp. To remove excess oil lay a tissue on the skin, do not wipe. New listingCLARINS Energizer Wake-up Booster SET/HOLIDAYS/Birthday/5-ITEM+BAG/Party/Travel. The third ingredient is purifying Alchemilla, an astringent plant extract that regulates sebum production to keep pores and the complexion clear. And finally, radiance-boosting Ginkgo biloba, to improve the skin’s uptake of oxygen so it looks brighter and healthier and to strengthen the walls of the skin’s super-fine network of blood capillaries. 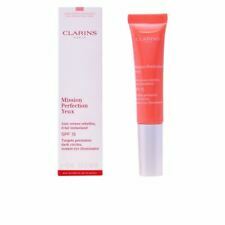 Clarins Men UV Plus Multi-Protection Day Screen SPF5 5ml. Anti-pollution cleansing cream with Moringa, Mango & Shea butter. The White Plus Brightening Emulsion clears the skin, creating a flawless complexion with the help of Vitamin C, acerola, alchemilla and spergularia. Skin is left feeling comfortable with apricot oil and white tea extract. Clarins Extra-Firming Jour SPF15 Wrinkle Control Firming Day cream 36ml..
Sun protection: SPF 15. Type: Face. Extra firming Night rejuvenating cream 15ml. Extra -Firming Mask 15ml. Clarins Santal Face Treatment Oil SALON SIZE 125ml withbox. You are bidding for a 5ml Clarins Super Restorative Day Cream and a 10ml Clarins On Step Cleanser both of which are brand new. These are from a non smoking and pet free home. Happy to answer any questions. Happy bidding! NEW Clarins Mission Perfection Serum 50ml / 1.7 oz. The result is even skin tone with a healthy radiance. NEW Clarins Extra-Firming Lip & Contour Balm 15ml / 0.5 oz. Skin is refreshed, hydrated and stimulated. BN " CLARINS " TRAVEL SIZE BLUE ORCHID FACE TREATMENT OIL - 5ML ! Suitable for dry or combination skin. Size: Travel Size - 5ml. Skin feels smooth, soft, and nourished. NEW Clarins Extra-Firming Neck Cream 50ml / 1.6 oz. It contains green seaweed extracts and sunflower auxins to smooth, firm and soften the neck and décolleté. To use: Apply morning and evening. Massage into skin, from chin downwards. NEW Clarins Cleansers & Toners Cleansing Milk With Gentian Anti-Pollution Combination/Oily Skin 200ml / 7 oz. It nourishes and firms skin giving it a supple, healthy look. To use: Warm a small amount between the palms of your hands. Super Restorative night cream 15ml. Sample Size 10ml x 3. This youthfulness-boosting lotion with an active, soft and refreshing texture is applied after make-up removal/cleansing. It absorbs perfectly into the skin and conditions it to be better prepared for the application of skin care products. Clarins by Clarins Super Restorative Eye Concentrate 15ml Perfector and Wonder Perfect Mascara . NEW Clarins White Plus Pure Translucency Brightening Revive Gel 50ml / 1.7 oz. Vitamin C, acerola, alchemilla and spergularia all help to reduce the appearance of dark spots. To use: Apply evenings after serum to the face, neck and decollete. Alternatively use as a sleeping mask, apply a thick layer to the skin. Clarins Skin Beauty Repair Concentrate. 15ml.